We are commissioning a significant contemporary work of art in the form of a stained glass window to be installed in the west tower of St Michael’s church, with a bell theme. There has been no new stained glass in the church since 1908, and so this will be a legacy of our time for years to come. When the sound of the bells ripples across the village everyone knows that this is marking a wedding, a funeral, a royal occasion, visiting bell ringers or the weekly church services. And so it has been for centuries. It is symbolic of many community events. The design of the windows and artist impressions of the installation are shown in this downloadable leaflet and we hope you like it! To complete this project we need to raise £75,000. Everyone in Blewbury will have been touched by the sound of bells and/or by the associated Church events at some point. Therefore, in addition to grants that we will apply for, we are asking for personal donations. You can donate any amount, large or small, as one person, as a couple or as a family. By donating to the window fund your name can be recorded in a book, which will contain the story of the Stained Glass Window from concept to installation. This will become an historical document and a record of who was connected to Blewbury in 2018/19. If you have a dedication for your donation, please let us know so that this can also be recorded in the book. You might wish to donate in memory of someone; to mark a wedding, funeral, christening or confirmation in St Michael’s; to celebrate an anniversary of some kind; because you love art; because you care for our medieval church; or just because you enjoy living in the village of Blewbury! If you would prefer to donate online, our JustGiving page is now up and running at https://www.justgiving.com/campaign/Resound. 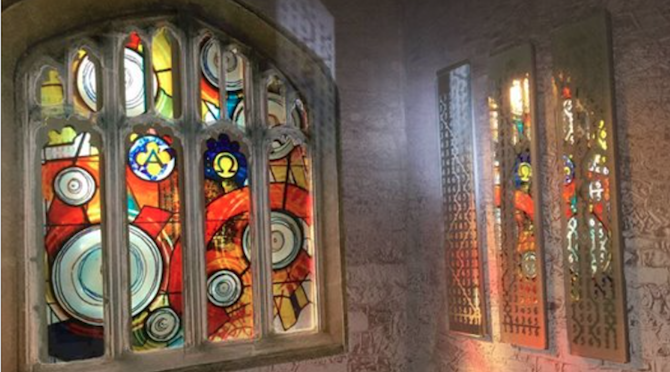 If you would like to know more about the artwork and the stained glass medium, any member of the project team will be pleased to discuss this with you. Thank you. Harber @ Harwell: Where art meets science! 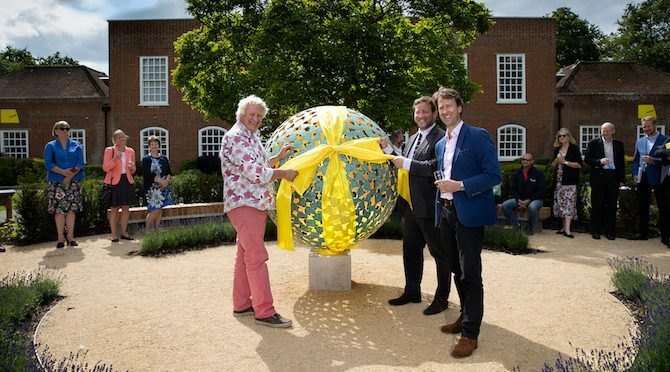 Blewbury’s Chelsea Flower Show award-winning sculptor David Harber was joined by Ed Vaizey, MP for Wantage and Didcot, and other dignitaries at Harwell Campus at the formal unveiling of his Mantle sculpture, located outside the Campus HQ building, the former RAF Headquarters at Harwell, Oxfordshire. 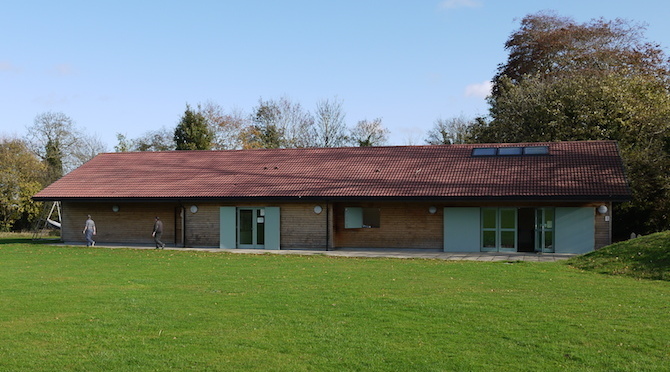 The Blewbury Village CIC (BVCIC) has been exploring with the Parish Council a more viable way of managing The Club House and Melland Room. We have had a proposal from two people living in the village to run the building enabling use by the community as well as developing a greater utilisation of the building and facilities to maintain the high standard of facility available. The BVCIC will remain responsible for the overarching management of the Clubhouse but as of 1st June 2018 the day to day operational management will be carried out by David Flynn and Mike Evans who will be the main contact for all use of the building be it regular sports clubs or one off bookings. Dave and Mike will be offering bar and catering facilities if you require this and hope to organise events throughout the year including screen of the World Cup matches and other events. 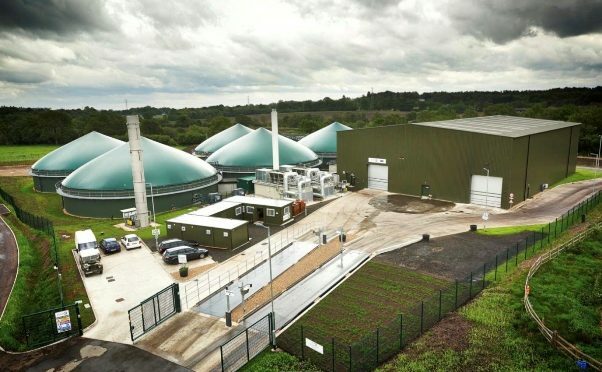 Last month a parish councillor visited Agrivert’s ‘anaerobic digestion’ facility in Wallingford, which processes 20,000 tonnes of food waste from our area each year. Caddy bags are delivered by lorry, then fed into a machine which mechanically removes the waste from its packaging. It is then macerated and digested anaerobically in large sealed tanks. This process creates enough energy to power 4,800 homes (via biogas, converted in gas engines into electricity). It also creates enough nutrient-rich fertiliser to cover 2,500 acres of local farmland. The whole process captures 4.5 million m3 of methane every year, which is equivalent to removing 71,000 cars from the road. There were two clear messages from the visit: firstly, there is no benefit to using compostable bags in your food waste bin (the process isn’t warm enough to compost the bags, and the plant is designed to remove all packaging, so you might as well use whatever bag you have to hand, including any plastic ones lurking in your cupboard). Secondly, there is still a huge amount of food waste going into black bins in our area. The waste from our black bins is incinerated (an energy-hungry process), whereas this plant converts our waste and effectively recycles it for a new purpose, so please do your bit and chuck your food waste in a caddy!